Most spiders spin a web and stay close to the web for much of their lives. A few don't spin webs or don't stay close to the ones they do spin. 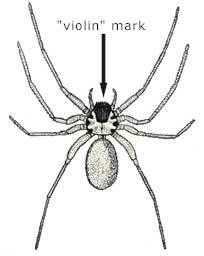 These spiders are more active hunters and tend to "wander" into homes more often than the less active type. The term "wandering spider" is not a taxonomic classification but rather refers to this more active, hunting behavior. Two wandering-type spiders in particular, the brown recluse spider and the hobo spider, are noteworthy because they are also venomous. Sticky spider traps are generally considered to be the best way to reduce the number of venomous, wandering-type spiders in homes. Not only are traps effective but since they contain no pesticides they are very safe to use. 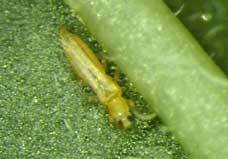 Sticky traps are very simple, consisting of a cardboard tube that is partly coated inside with a sticky material. The spiders wander into the tube at one end, but never make it out. Traps are inexpensive but can also be home-made (see Making Sticky Spider Traps). Place traps along walls where spiders tend to move and behind furniture. Replace traps when they become full of debris. If you are finding more than just the occasional spider indoors, or you are especially sensitive to them, consider treating the exterior of your home with an insecticide barrier. This barrier will slow the movement of wandering-type spiders from outside to inside. To establish the barrier you'll need to spray a 6"-12" band of insecticide on the foundation starting from where the house siding ends to the soil (this is sometimes called a "perimeter spray"). Onslaught Microencapsulated Insecticide is a good choice for this application because the microencapsulation makes it long-lasting compared to non-encapsulated insecticides. Yellowjacket wasps (social wasps in the family Vespidae) are significant pests in grape vineyards both in terms of the direct damage they do to fruit and also the impact their aggressive, territorial behavior has on vineyard worker productivity and safety. Most wasp species forage for live prey, mostly other insects, as well as carrion and plant sap. Maturing grapes are a source of plant sap and wasps will tear the outer skin to get at the grape juice inside causing yield and quality losses. Since wasp nests reach their maximum size about the time grapes mature, this damage can be significant in some varieties, in some years. The social wasps build large communal colonies (nests) consisting of hundreds to thousands of individual wasps each capable of delivering a painful sting to an intruder. These colonies are built both above ground (aerial nests, see photo), and below ground in abandoned rodent burrows or other cavities (ground nests). Nests are aggressively defended against intruders and even a slight disturbance can incite swarming of a perceived enemy. These large, aggressive colonies can be a hazard to vineyard workers and can slow or even stop a work crew. Multiple stings from swarming wasps can be a medical emergency as well, especially if the victim is allergic to wasp venom. For these reasons vineyards have tried to manage wasp nests in a variety of ways. Some managers depend on early season capture of queens prior to nest establishment while other vineyards use a kind of seek and destroy strategy for existing nests during the summer. Until about 10 years ago some growers used poison baits to control yellowjacket wasps in vineyards and orchards. At the time there was an insecticide that could legally be used to prepare a poison bait that when deployed in vineyards and orchards significantly reduced yellowjacket activity, sometimes for several years following a successful baiting program. The baiting technology was inexpensive and had virtually no effect on non-target organisms or the environment***. About ten years ago this pesticide was removed from the market, for reasons unrelated to its use in wasp baits, and there has been no replacement until now. Onslaught Microencapsulated Insecticide is now labelled for use in preparing poison bait for yellowjacket control (read and follow label instructions). See Using Poison Bait To Control Yellowjacket Wasp Nests for details regarding bait preparation and deployment. One or two bait stations per acre (see page cited above) should be sufficient to maintain control in most situations. Start baiting about mid-summer, replace baits about every three days until the level of control you want is achieved. Don't start much earlier than mid-summer since the low number of foraging yellowjackets prior to this time will limit the effectiveness of the bait. ***Because all wasps on predators they are considered beneficial insects, especially in agricultural systems. This benefit, however, must be weight against the potential for losses as outlined above. Boric acid, or borate salt, is an excellent wood preservative, fungicide (kills rot fungi) and insecticide. It is very low toxicity, has low environmental impact and is relatively cheap. It is an ideal material for treating both hardwood and softwood against attack by fungi (dry rot fungi), and insects. The only real downside is that borate compounds are generally water soluble so must be used in dry environments or protected with a finish of some kind that seals them in the wood. Borates are available as dry powders (TimBor and others) or as glycol-based liquid concentrates (Bora Care and others). Glycol is intended to improve the penetration of borate into wood fibers but studies have not definitively demonstrated an advantage over simple water solutions. Glycol-based products are also somewhat more expensive than powder forms. Both TimBor and Bora Care should be applied to dry, unfinished wood surfaces with a pump sprayer or paint roller. Two coats are sometimes needed (see product label). 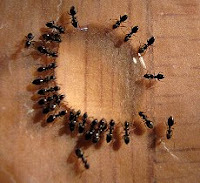 Powder forms like TimBor can also be applied as a dry powder to wall voids for carpenter ant treatments. Borate wood treatments are generally not available in stores but are available here. Have you ever found small, brown, slow-moving bugs crawling around your house that appear to have a hard-shell? If you look closely the hard cover appears to be split down the back. These are beetles, probably one of several "stored product" beetles that infest dry foods and natural fabrics. If the beetles appear black, or mottled with red/gray/black, instead of brown they are probably one of the dermestid (Dermestidae) carpet beetles but the brown ones are likely one of the anobiid (Anobiidae) beetles, for example the cigarette or drugstore beetles. If the brown/black beetle has a tan stripe across the back it is probably the larder beetle, another one of the dermestid beetles. This very large and diverse group of beetles are specialist scavengers on dead plant and animal products. They evolved as nature's master recyclers that help breakdown and decompose dead plant and animal tissue. If you think about it from the beetle's point of view a piece of wool cloth (or animal carrion) or a dog biscuit (or cache of seeds) is just another dead animal or plant, and something good to eat. The larvae of all these different beetles are the real recycling workhorses whereas the adults are simply there to ensure the next generation. Depending on the species, larvae can survive on a wide range or natural plant and animal matter, from cereal stored in cupboard to the wool rug in the den. In more natural situations they would feast on dead plant material or animal carcasses. When you find the beetles indoors it usually means there's an infestation somewhere in the house. The beetles are harmless but obviously if the infestation is large damage can be done to your stored food or natural fabrics. 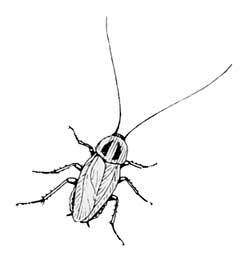 See the pages cited above for ways to detect and manage infestations of stored product beetles. Once the infestation is found and cleaned up you can treat the surrounding area with one of the new Botanical Insecticides like EcoPCO AR-X to eliminate any stragglers that may have been missed. 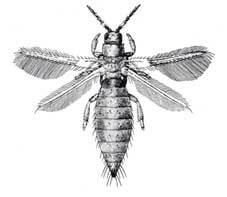 This blog is about insects and mites and the damage a few of them cause to we humans. 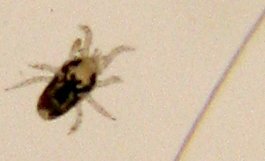 Few people realize that a tiny mite that lives in the dust in our homes can cause severe, even life-threatening, allergy symptoms. While most people are unaffected, just like most people are not allergic to grass pollen, for those that are it can significantly impact their lives. Allergies to household dust are common and tend to be worse in winter when houses are sealed up tight against cold weather. All allergies are caused by the reaction of our immune system to molecules called proteins that enter through our lungs, digestive system, or skin. If we eat something we are allergic to our body reacts, often violently. Likewise if we breath something we are allergic to we experience a range of symptoms from a mildly stuffy nose to anaphylactic shock. An allergy to dust is caused by proteins in the dust that we react to when they enter our lungs. The allergy-producing protein (allergen) is in dust because of a tiny mite, the dust mite, that lives in and consumes part of the dust. The allergen is part of the mite's waste products. The key steps to treating dust allergies are (1) reduce the amount of dust, and allergen, in your environment; (2) reduce the activity of dust mites; (3) medically treat the allergy symptoms. Dust and allergen can be reduced by normal cleaning, choosing the right the furnishings for a room, and filtering the air to remove allergen particles. It is especially important to reduce the amount of dust and allergen in bedrooms because of the adverse effect these allergies have on sleep quality. Wet cleaning is much better than dry sweeping or dusting which only serves to stir up dust and the allergen pool. Most types of vacuum cleaners are counter productive as well. Floors and windows should be regularly washed, even the walls and ceiling in the bedroom should be washed yearly. No special soap is needed. The idea is to remove dust and allergens and simple water plus a mild detergent will suffice. Remove rugs and other dust-trapping fabrics from the bedroom. Furniture should be covered in removable fabric that can be washed at least once a year. Bedding should likewise be washed as often as possible, plus an allergen-proof mattress cover. Finally, install an air filtering system (air purifier) that employs HEPA-type filters. These filters scrub the air and remove nearly all suspended allergen so it can't enter your lungs. These air filters can be fairly expensive, and expensive to operate, but do reduce the level of allergy-causing allergen in the air stream. See Air Purifiers For Dust Mite Allergy for more information. 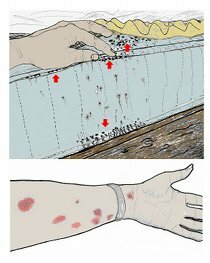 Dust mites themselves are nearly microscopic, don't bite and would go largely unnoticed except for the fact that they produce these allergens. 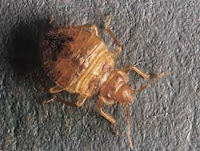 You can't effectively treat the mites directly with insecticide but you can slow their development by reducing dampness in the air (humidity), as dry air tends to reduce mite activity. Central heating and air conditioning are very effective. Also, it may help to put a barrier between you and mites that may live in your mattress using an allergen-proof mattress cover. Very effective allergy therapies are now available. Mild allergies can be treated with OTC medications (respiratory allergy) while more severe allergies can be treated with desensitisation therapy or prescription allergy medications. See your medical professional, get tested for the specific allergen so that it can be managed. As a follow-up to last week's post about the new poison baits that can be deployed to eliminate threatening yellowjacket wasp nests, here are some details. Bear in mind that while certain wasps can be dangerous, especially in late summer and early fall, all wasps are important predators of other insect pests. Only remove those wasp nests that are directly threatening such as nests located near picnic areas or playgrounds. 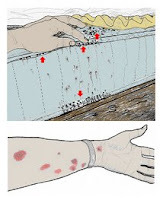 First, see this article about Wasp Removal With Baits at the 'Bugs site for background information. Start your baiting program in mid- to late summer, starting any earlier is probably a waste of time since wasp activity is generally too low for baits to be effective until mid-summer. Poison baits are prepared from some kind of minced meat (canned tuna and canned cat food work well) plus Microencapsulated Onslaught Insecticide (see below for insecticide and kits). Be certain that your bait station and placements are designed such as to prevent all non-target animals from accessing the bait. It is your responsibility to ensure that the poison bait is deployed so that only wasps can access it. Once foraging wasps locate the poison bait they will carry a portion back to their nest (aerial and ground nests) where it will be feed to developing brood and eventually the queen. You will probably notice a significant reduction in wasp activity in 1 to several weeks that should last all season. Poison baits are only effective against scavenger species since non-scavenger species are only attracted to living prey, not canned tuna! For outdoor events such as picnics and weddings you'll want to start your baiting program at least a week before the event (after mid-summer) to have the best chance of effectively reducing wasp activity prior to the event. Please read and print our Disclaimer. A new insecticide is available for use in preparing baits for control of troublesome yellowjacket (social wasp) nests on an area-wide basis. 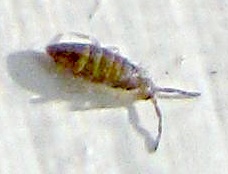 The insecticide is called Onslaught Microencapsulated Insecticide. The Onslaught label allows for the insecticide to be mixed with a meat-based bait and dispensed to foraging yellowjackets. The combination should be very effective for area-wide suppression of yellowjacket nests and may even suppress wasp numbers the following year because of the impact it has on queen production. Details regarding bait preparation, dispenser design, the Onslaught label and theory behind baiting can be found at the 'Bugs site here.